Keypad is set numeric or alphanumeric characters with a limited number of buttons. The numeric keypad buttons only contain numeric characters, from 0-9, whereas alphanumeric keypad same with numeric keypad but added character alphabet A - D. Both types of keypad is equipped with a special character '*' and '#'. Thus, a numeric keypad will contain 12 characters (12 keys), while the alphanumeric keypad consists of 16 characters (16 keys). This is difference from the keyboard, which is a set of keys with alphanumeric characters (plus special characters) which are more variations according to the ASCII standard. 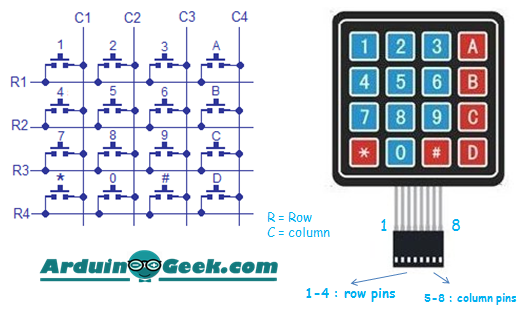 Based on picture above, then emerge the ‘term’ of keypad ‘3x4’ (3 columns x 4 rows) for numeric keypad, and keypad ‘4x4’ (4 columns x 4 lines) for alphanumeric keypad. Look again at the picture above. Note that the numeric keypad would only need 7 pin, while the alphanumeric keypad will only need 8 pin only. Quite save pin I / O, isn’t it? It would be helpful if you're using Arduino boards with limited I/O pins such as Arduino Uno, Nano, Mini Pro, etc. 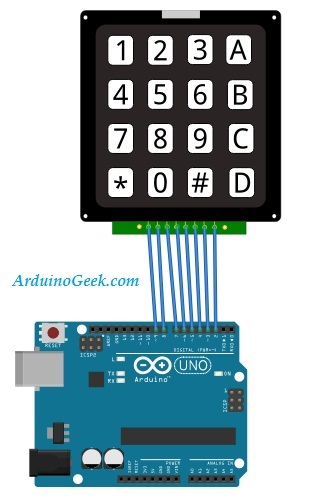 To read keypad with Arduino is very easy. 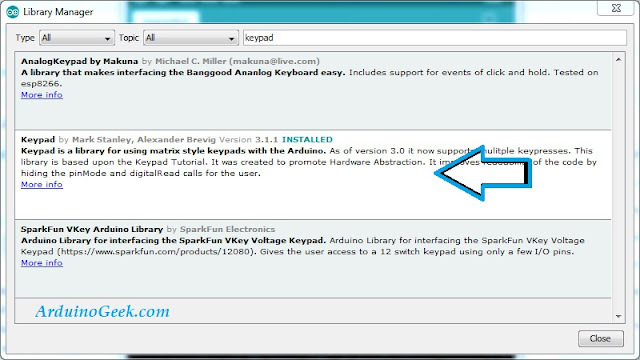 Thanks God, because there is provided a special library to handle keypad with Arduino, namely 'keypad.h' library. This library includes 'Hardware Abstraction Library', which is a ‘turn-key’ library, covering all handling functions of basic hardware such as a button, keypad, LED, etc. So, programmers can focus more into programming purposes, no longer build program from the beginning. Hopefully, the HAL libraries can be fast and easy for programmers to build a system. Nex,t connect your keypad (I use a 4x4 keypad) with the Arduino as shown below. First, download and install this library through the library manager in ‘Sketch-Include Library Manage Library’ menu. Then type 'keypad' in search box then selects 'Keypad' library. Install the library by pressing 'INSTALL' button. 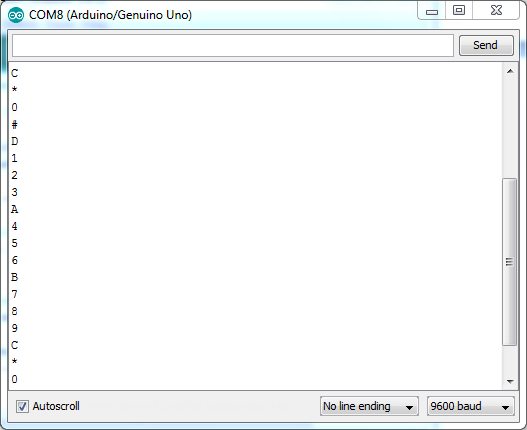 To debug the results, please open your Serial Monitor window through the ‘Tools-Serial Monitor’ menu. Then press any key on your keypad, and note the character will appears in Serial Monitor window. Keypad is required for applications or systems that require characters inputs but not too many, such as ATM keypad, access doors entries, etc. If using the keyboard instead will more complicated, isn’t it?